Don't look now, but there's a Dalek in your soup! Vandor's high-end ceramic tabletop collection will delight even the most discriminating Doctor Who fans! 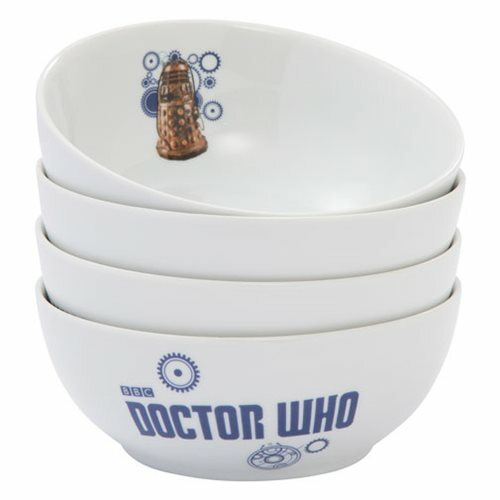 Perfect for everyday dining, fandom events, and collector gifting, each of the 6-inch diameter bowls in this Doctor Who 4 Piece Ceramic Bowl Set features a bright, beautiful character design on the inside and the show's logo on the outside. The set comes in a full-color gift box and is a perfect match to the Doctor Who 4 Piece 8-Inch Ceramic Plate Set (sold separately)! Dishwasher and Microwave safe.